Do you have a question, comment or need information regarding the OSAA? We're here to help. Looking for Auctions? Find an OSAA member auction near you! Rules For the Rookie & Pro Div. WELCOME! On behalf of the Board of Directors of the Oklahoma State Auctioneers Association, we would like to personally invite you to become a member. If you are interested in becoming a member, learning more about the Oklahoma State Auctioneers Association, or if you would like to attend our convention, more information can be found in The Chant. The Chant is our quarterly newsletter. If you have further questions contact Tony Wisely, OSAA President, at 580-370-0711. Whereas, it is necessary, in order to fit ourselves for the responsibility of Auctioneers, to cultivate the spirit of co-operation, improve our profession and protect the interest of the Auctioneer, to protect the public against unscrupulous practices; therefore, we do constitute ourselves the Oklahoma State Auctioneers Association. Error: Error validating access token: Session has expired on Saturday, 25-Aug-18 14:10:48 PDT. The current time is Friday, 26-Apr-19 05:26:41 PDT. 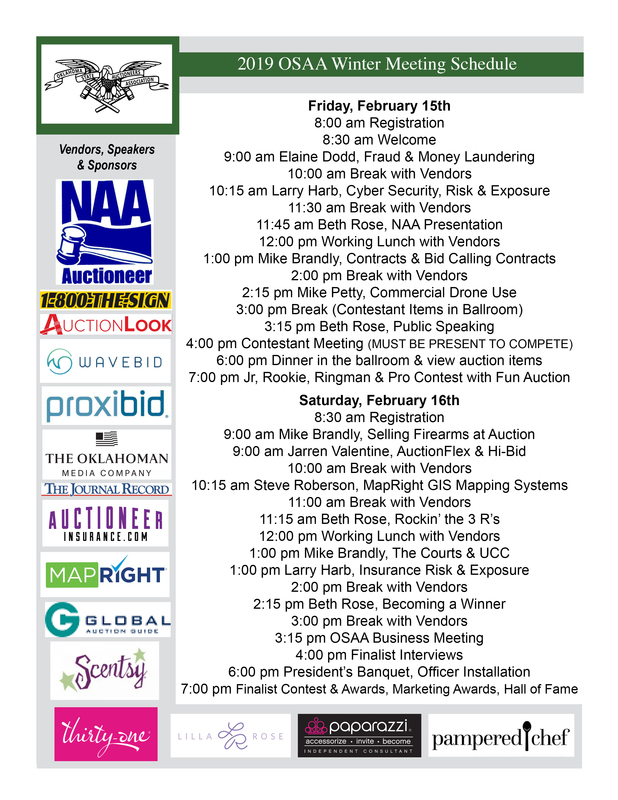 On behalf of the Board of Directors of the Oklahoma State Auctioneers Association, we would like to personally invite you to become a member.